How do I vote for the candidates? The candidates will appear on the back, bottom left of the ballot. 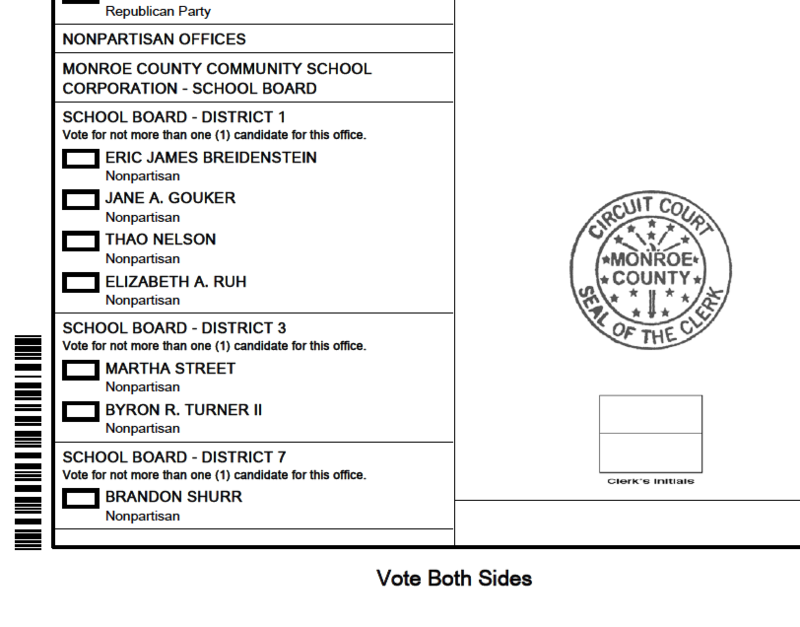 The MCCSC school board race is nonpartisan. If you vote straight Democrat or Republican, you still have to vote for school board candidates. Although the candidates represent specific districts, they are all "at large" which means you can vote in every MCCSC district. Please see our election page for more information here. Missed the forum? Watch the video here. Brittani Howell, "No vacancies in the MCCSC, R-BB school board races," Herald Times, August 22, 2018. ​Ernest Rollins, "School board candidates set for fall," Herald Times, August 24, 2018. Brittani Howell, "Forum held for MCCSC board," Herald Times, September 18, 2018. Emily Isaacman, "MCCSC school board candidates address parent and teacher concerns," Indiana Daily Student, September 19, 2018. "Keys to the Candidates: School Board Races," Herald Times, October 5, 2018. ​Brittani Howell, "Four Contenders in MCCSC District 1 Race," Herald Times, October 23, 2018. We sent out a questionnaire to every candidate. Not every candidate responded. Describe your connections to public schools. What is the role of the school board? What skills and experiences will you bring to the board? What is the goal of a public education system? What is the best way to evaluate our schools? What are the biggest problems in public education? What are the biggest challenges facing the Monroe County Community School Corporation? What is the role of extracurricular activities in MCCSC? ​Describe your position on public funding for charters and voucher schools. Did not provide a response. 1. Describe your connections to public schools. I am a retired music educator, having taught orchestra and strings in the public schools for 40 years. I taught all levels of children from elementary school, to middle school, to high school. Thirty six of my years were in the MCCSC schools, and my initial teaching of 4 years was in Northern Virginia public schools. I continue to support the orchestra program in MCCSC, several other areas, and our school system in general. 2. What is the role of the school board? The school board’s role is to establish policies and then make decisions and procedures to implement them. The role is not administrative, but rather policy oriented. While determining these policies, school boards should always put the learning, growth, and safety of the children and young adults of the school system first in their thoughts. The board also needs to follow the state and national legal requirements while considering public opinion. 3. What skills and experiences will you bring to the board? Having been a lifelong teacher and part of our MCCSC for so long, I bring the wisdom and experience of those years. Being in the buildings and being a part of our schools, I know how “things work” and have a very knowledgeable idea of how to implement the aforementioned policy decisions. I have taught and worked with thousands of students, parents, administrators, colleagues, and school board members through my years. I know the Bloomington community – I know the schools – I know the history of this school system – and I also am aware of the future goals and aspirations of our schools and community. Being an orchestra teacher extends beyond the classroom as we perform in public as a “team”; we created and produced hundreds of successful fund raisers to reach our goals of touring and performing our music throughout our country, and even abroad, and proudly representing our schools, our city, our state, and our country; we became a family, and therefore I really KNOW children, and know parents, and know what makes them tick, and know how to work together to get things done. Besides all of this, it took great discipline, organizational skills, attention to detail, enthusiasm, pride, energy, drive, and leadership on my part to make our orchestra program a shining star of the MCCSC. 4. What is the goal of a public education system? In its most simplistic, yet beautiful way, our public education system should guide students as they grow from children into mature young adults who are responsible citizens. Our schools can do this through excellent teaching and providing experiences so students can learn in a way that helps them academically, mentally, physically, and creatively. This will empower our most precious resource – our children. 5. What is the best way to evaluate our schools? I feel several things should be considered when evaluating our schools. At the high school level, one measure is the graduation rate. Also critical is the college and career readiness of those going into higher learning; and the offering of career and technical diplomas. Throughout our school system: What is the dropout/student retention rate? Do our schools have a challenging curriculum? Is technology integrated throughout? Is there a staff professional development program? And, although I feel that standardized tests should not be the primary appraisal, the ISTEP results, reading evaluations, End of Course Evaluations, and AP Exams should not be ignored. 6. How can the school board support teachers? First and foremost, the school board should “have the teachers’ backs.” Members should include the teachers’ best interests, and the challenges they face, along with all the other considerations when making policy decisions. By keeping themselves well informed of issues and directions being considered, board members will make good decisions, and that, in turn, will be a support to the teachers. I feel board members should have no agenda other than keeping all children and teachers first in their thoughts and creating a positive, approachable relationship of support. Finally, board members support the superintendent by allowing him/her to be the professional he/she is trained to be, and let him/her lead. 7. What are the biggest challenges facing the Monroe County Community School Corporation? Unfortunately, every school corporation’s biggest challenge falls back to revenue. Are their enough funds available to do our mission? Can we provide the kind of empowering educational experience needed for our students? Can we entice the best educators and staff to work for us? On top of that, student and staff safety is going to take resources and innovative ideas to be fully implemented. How do we as a school system stay current and relevant in a fast changing world? How do we keep students engaged, parents involved, teachers inspired? It is always important is to stay inclusive, diverse, and welcoming to all. 8. What are your budget priorities? We must provide a safe place for staff and students. Without safety, no learning is going to happen. To ensure this environment, we need to provide resources to educate and train staff and students on safety, and threatening situations. In addition resources are needed to provide a network of professionals and services for mental health supports, counseling, and psychological matters to offset the eroding societal pressures that are leading to this violence, and also to drug usage and lost morality. MCCSC should continue to offer as many curricular and extracurricular opportunities as possible and these should be inclusive for all students. Everyone who works for MCCSC from doctorate degrees to part time bus drivers and cafeteria help should feel valued and be fairly compensated monetarily. 9. What is the role of extracurricular activities in MCCSC? Extracurricular activities bring a wide myriad of other kinds of learning experiences to students. They provide a critical outlet for expression and knowledge whether it be through music, the visual arts, theater, sports, academic teams, clubs, or support groups. These opportunities help develop a most well rounded individual. The interaction with other students in these settings brings the knowledge of team work and achievement of goals in a cooperative manner. For many students, it’s this extracurricular participation that excites them the most about their school, and inspires them to be engaged in their school community. Extracurricular activities are invaluable! 10. Describe your position on public funding for charters and voucher schools. I am completely against the use of public funds intended for public schools to be used for anything other than our public schools. Our government provides for a free public educational opportunity for all. If someone wants to pursue an alternate path, then they should be prepared to fund that desire, and they should not have access to, or help from, public monies. Payment vouchers should NOT be awarded for charter or online schools from public funds. As a working mother of two MCCSC children, I have proudly served our students and teachers for the past 9 years as a PTO leader, volunteer, and room mom in Arlington, University, and Tri-North Schools. I am passionate about supporting and recognizing our students, teachers, and administrators, and I have enjoyed donating time, resources, and providing the occasional teacher/staff appreciation luncheon when given the opportunity! The most important role is to be a champion for public education while helping to improve student achievement. Board members are also responsible for: hiring and evaluating the superintendent; helping to set vision and goals for the district; adopting policies, curriculum, and budget to achieve district goals; overseeing facilities and construction; and managing collective bargaining process for employees. Here are my experiences that align with the role listed above. First, I am proud product of the system and fierce advocate for public education. I will continue to be the champion for students, teachers, staff, and administration to support and drive collective priorities. Second, I have experience hiring and evaluating leaders. As a former recruiter for the Hospital Corporation of America, I was trained and certified on interviewing best practices. I also served on hiring committees and trained managers throughout the company on interviewing practices. Third, I have served on boards and have experience working with board colleagues to help organizations reach their vision and mission. Fourth, I have budget experience in my former role as the Strategic Sourcing Manager for the Hospital Corporation of America. I managed and forecasted a $15M workforce budget among 5 divisions. Beyond board responsibilities, here are the qualities that would make me an effective school board member. I’m a natural collaborator and will work with others to help achieve our district’s goal of empowering students in the educational process to become good citizens. I’m passionate about serving the needs of all students, no matter their path. There is not one single path to success but many. I’m open to different points of view and will go out of my way to include the collective/shared voices of our parents, students, teachers, and staff. Having been a student on free/reduced lunches, I personally empathize with socio-economic disparities. I am confident my experiences and qualities are a good match for a school board member. To educate and develop well-rounded individuals who become productive and contributing members in their community and greater society. The quality of learning in any school is determined by many factors. Unless learning gains are being measured by a standardized test, it would be difficult to use a test to measure a school's success. I believe we should refocus our conversation on not scores (good or bad) but rather which tests are actually useful to teachers, schools, and districts to measure student progress. What type of formative information, including tests scores, help to measure a student’s learning over time? How are we using test scores and other formative assessments to improve our learning plans and teaching methods to reach student achievement goals? Provide a forum to listen to their collective needs and concerns, then advocate those needs to the board. Encourage parents to ask teachers how they can help inside and outside the classroom. I would defer to our current board members to share their thoughts on the biggest challenges facing MCCSC. They have been the voice for our community and would know the main concerns facing our district. If elected, I would involve both engaged and unengaged stakeholders to gain further insights on our biggest challenges. In terms of addressing those challenges, those doing the work provide the best insights to solving our problems. Budget priorities should reflect the priorities of the community not an individual board member. I would reach out to the MCCSC community to learn about their shared needs and priorities to help adopt the budget. More importantly, the board should ensure these priorities help the greatest number of students and are aligned with the mission of our district. Student development involves both academic and co-curricular activities. Afterschool programs help fill a gap by keeping students safe after school and provide enriching academic and social activities. Activities such as music, chess, scouts, and athletics are important to the student experience so they can also learn time management, organizational, and teamwork skills. I unequivocally believe in the value of public education. I’m a proud product of the public education system, and so is my husband, Mike Nelson, who attended the Monroe County School Corporation from K-12. Any time money is being taken away from this effort, it concerns me. Although our state legislature approved charter and online schools as well as vouchers, I am thankful our community has supported our public schools with two referendums to offset district costs due to the reallocation of funding to these programs. I was born in Bloomington and attended Rogers, Binford, Batchelor, and South. I have two children currently attending Marlin Elementary (1st and 2nd Grade) and a Sophomore at South High School. I am currently serving as the Treasurer for the Marlin PTO. I joined the PTO three years ago and organized the implementation of the School Kidz supply kits, helped with numerous fundraising events and participated in events to educate voters about the referendum renewal. The school board is the entity that holds the School Corporation accountable for achieving results and setting expectations. The school board is also the supervisor for the Superintendent, including the responsibility of hiring and firing. Perhaps most importantly, the school board is there to represent the community’s best interest when it comes to educating the future generations. I own my own business where we serve as Professional Guardian for the elderly and disabled. By serving as guardian we make health decisions and are responsible for the finances of these individuals who have been declared incompetent. A small portion of these clients have an intellectual disability and receive services paid for by Medicaid under the Bureau of Developmental Disabilities division. Although we don’t come into their lives until they are 18, we have had experience with clients finishing their final year at North with an IEP. We work closely with many service providers in town who support this community and have many parent connections who are navigating the resources available to enroll their differently abled child in school with supports. In our role as someone’s Guardian, we are also responsible for all their funds. For some of our clients, we have learned all the difficult steps in applying for government assistance and renewing it. We also are responsible for detailed record keeping to provide reports to Social Security and the Court of how their funds are spent. We do a great job of saving for our clients who are living off a very low fixed income to help them have the best quality of life. I am also an Enrolled Agent with the IRS and have been preparing taxes and tax planning since 2002. Due to this knowledge, I was asked to speak to the special education seniors in December of 2017. The goal was to educate this graduating group about the cost of living and help them learn what they would have to earn to live on their own. Although we did not get into the different government resources available, through our conversation, we were able to determine that you would need to make $19,000 a year in Bloomington to live pay check to pay check and you would not be able to afford a car. I had so much fun going through this exercise with this class; I look forward to having another opportunity like this. I have been working with small businesses, families, and retired clients for over fifteen years towards financial goals. I help them walk through a budget, forecasting their future and even drilling down on specific costs that could be changed. I enjoy creatively thinking about options to reach their financial goals. Over the course of my career, I have developed many contacts in the financial world and the community service world. My experience allows me to pull what I need from various resources to make something happen. I believe that my experience will allow me to bring some fresh ideas and financial skills to the board. Our public education system teaches our students critical thinking skills and life-long learning skills. Our system aims to provide our students the skills to develop their knowledge, passion, and exploration of ideas. Also, our system provides students and their families a much-needed community, where emotional learning is also developed. Teaching our students empathy should be a goal as well. I believe that our teachers, principals, and education experts need to be involved in developing a plan for evaluating our schools. They are our frontline and have valuable knowledge to understand what works and what doesn’t. Due diligence should be performed to ensure educational equality in the evaluation process. I do not believe that standardized testing is the way to evaluate schools. The harmful misuse of high-stakes standardized testing has the most severe impact on low-income and minority students particularly with Indiana’s practice of handing out failing school grades and threatening school takeovers. Testing is also often a source of anxiety for students, and some students do not perform their best when taking a test, even when they have mastered a skill. The only thing that high scores on standardized tests accurately predict is the high socio-economic status of the students. High scores = wealthier students. It is misguided to evaluate a school based on the results of a high-stakes standardized test; you must evaluate how the school grew as a whole, evaluated on multiple factors. We need to hear from the teachers what is working and what isn’t working. If something isn’t working, we need to participate in collaborative discussions on if or how it can change. Our teachers need to be empowered to do what they are best at; teaching. Perhaps the most memorable issues at the moment are finding the best way to address transportation needs and food security needs. MCCSC is a large school district and balancing all the various needs of the community is a difficult task, especially with state budget cuts. I believe the move towards funding social workers in the school buildings as well as a psychologist was an important move. I would like to hear feedback from that staff if they feel like they have enough support or if they need more. If they need more, what would that look like and can we achieve that goal. I would also like to make sure that our employees are well paid. For instance, I spoke to a custodial staff who indicated he used to be a teacher’s aide, but he applied for the custodial job because it paid more. Teachers and staff need to be paid a living wage. These positions are important to a school’s operation, and pay is the one way to attract and maintain talent. Extracurricular activities build community. They provide a way for students to meet those with similar interests and begin to build friendships, hopefully lifelong. They also provide a creative outlet that cannot always be addressed in the school curriculums. Students can learn new skills that allow students to seek out volunteer and community activity options after they graduate, which will allow them to continue to meet new people and build friendships. Vouchers drain essential public funds away from community-based public schools while lacking in the accountability that is expected of public schools. We need to understand what families are seeking from the charter and online schools and strive to bring those opportunities (and dollars) into MCCSC. Vouchers use public funds to send students to private schools. Private schools are legally able to discriminate and choose who attend, even when the student’s spot is funded by a voucher. During 2013 public funds spent on vouchers in Indiana totaled $37 million. In 2017 that grew to $146 million. Public schools accept all students with open arms and proudly reflect our diverse society. They do not exclude anyone because of academic ability, sexual orientation, religion or parental income. 1. Describe your connection to public schools. Public schools are interwoven into my life and my conception of who I am. From birth I was raised by an educator that demonstrated the necessity, utility and ideal purpose of public education. Public schools have helped to raise my family out of poverty with my grandfather being privileged enough to go to one of the first Black technical high schools in the south, giving him the education and skills necessary to become one of the first Black Foremen of United States Steel. My father received an education from the Gary Public School System which at the time was still a world renowned school district setting the standard for what public education could achieve. His education allowed him to accomplish more than his father did and allowed for him to provide my sister and I with opportunities that his father could only dream of providing. In my life, a well-funded public school gave me the opportunities and experiences to figure out what I truly desired from this world. I can honestly say that public schools have made me the man I am today and it is my intent to give as much back to public schools and public education as it has given to me. The school board functions as the community’s elected voice in matters regarding the public schools. Ideally, they represent community values, priorities, and goals for public education. The Board provides an avenue for corporation accountability, allowing the public to address concerns and seek solutions to problems. One of the board’s most important functions is to hire a Superintendent, since it is their role to administer the day-to-day operations of the school system. While the board creates policies, it is the superintendent’s responsibility to see them implemented in a successful way. For a number of years I have taught at public schools with my last teaching position being at Edgewood High School in 2017. I have worked for an Indiana school system that has been taken over by the state and seen the tragic hand that teachers, administrators, parents, and most importantly students have been dealt by the takeover. I now have the privilege of getting to work directly with the families of Monroe County as an Assessor for the Department of Child Services. This position puts me inside our schools on a regular basis, allowing me to see the amazing achievements of our school system as well as its shortcomings. In a nonprofessional capacity, I am in my second year of participating in the MCCSC Real Men Read program and the Million Father March. I also serve on the City of Bloomington Commission on the Status of Black Males which oversees a bicentennial initiative to read 200+ hours to young people in our community, both in school and out, in an effort to promote literacy to children of all ages. Public education in America provides the foundation for creating informed, broad-minded citizens who have gained the skills and confidence to realize their best selves. It is open to everyone—regardless of background, ability, or beliefs—and should be paid for collectively by all the citizens as a common good. Because it serves everyone, it should provide a broad range of educational choices with the understanding that each student has distinctive goals and desires. Nevertheless, public education should also provide a common framework for students to understand themselves, their country, and their place in the world. Teachers are in the best position to evaluate their students because they are the ones who spend the most time with them and are intimately involved in their day-to-day learning. Similarly, principals are the ones who should be in the best position to evaluate the teachers in their schools, because they have the most contact with the teachers. Ideally, then, schools would be evaluated by people in intimate contact with the schools. The criteria should be broadly drawn, attempting to determine the overall well-being of the students in the school, and not simply test scores, “growth,” or graduation/advancement rates. MCCSC employees who are in a position to know the schools well should be the ones to evaluate school quality. Teachers must be given the MCCSC Board of Trustees’ full support. This includes establishing a budget which provides the equipment, books, and other essential items they need to teach their classes. The Board should develop a close working relationship with the Monroe County Education Association in order to understand teachers’ needs and concerns. Furthermore, class-size limits should be maintained, and solutions found for those schools struggling with large enrollments. The biggest challenge facing MCCSC today is economic segregation. We have some of the best schools that Indiana has to offer. Yet not all students can take advantage of the opportunities these schools offer. Because of the way the current school districts are drawn, two elementary schools—Templeton and Fairview—have a disproportionate number of low-income students whose needs differ from the wealthier population. MCCSC is, rightly, committed to a well-rounded education for all of our students, but when teachers must spend significant portions of their day attending to other needs, children’s educations suffer. The MCCSC budget represents in its most concrete form the priorities of the school system. So it should reflect the priorities of the community and this means that the budget process must be as transparent as possible. Community input should be taken seriously and everyone should be able to gauge the process. Due to the stress and trauma inflicted by the drug epidemic and poverty, we must ensure adequate funds to have professional social workers in every school. Teacher salaries need to be more than competitive in order to continue to recruit the best teachers. Large, silly expenses (like the new $5200 mechanized flag at Bloomington South High School) must be minimized if not eliminated. Extracurricular activities play a large and meaningful role in the lives of students. From sports, to clubs, to bands, activities beyond the classroom enrich students’ education and provide avenues for social development, refining skills, and plain fun. We should be wary, however, of asking too much of our teachers. We expect much and receive more from our teachers during the school day, and to demand from them commitments to extracurricular activities can be exhausting. We must, therefore, encourage students, faculty, and staff to participate in extracurricular activities, but recognize that we should not overburden our teachers. I have three children in MCCSC public schools. I also am in connection with MCCSC through my Community Engagement job at Indiana University. The role of the school board is to make sure that the public schools are the best that they can be for all students. The school board also needs to be the listening ear of the community that elected them in order to help meet the needs of both the public school and the community that they serve. The school board also has the responsibility of hiring the superintendent. I bring the experience of being a parent of school aged children. I also am very involved in the local community through my work in local non profits and my current job placing/supervising students in over thirty local nonprofits, city departments, and local schools. The goal of public education is to provide the best education for all students. Public education should provide all students with an opportunity to learn what they are passionate about and help propel them forward into life after high school. The teachers, principals and local school board should be able to evaluate their local schools. The school board can support teachers by providing policies and systems that allows them to be the best teachers possible. The school board can fight against policies and systems that place obstacles in their way. One challenge that is facing MCCSC are policies that are being imposed from the state. Another challenge that is facing MCCSC are charter and voucher schools. Supporting and advocating budget priorities that place children, education, and teachers first. Although they are important they should play a secondary role to education. I disagree with public funding for charter and voucher schools.